Onsite at Camelot in Coomera | Gold Coast’s latest community, next to billion dollars of new developments. The billion plus dollar Coomera Town Centre, Stage 1 to be completed later this year and a 5-minute drive from Camelot, our new community. Coomera East Shopping Centre, existing stage $12.5 million and in the process of expansion. 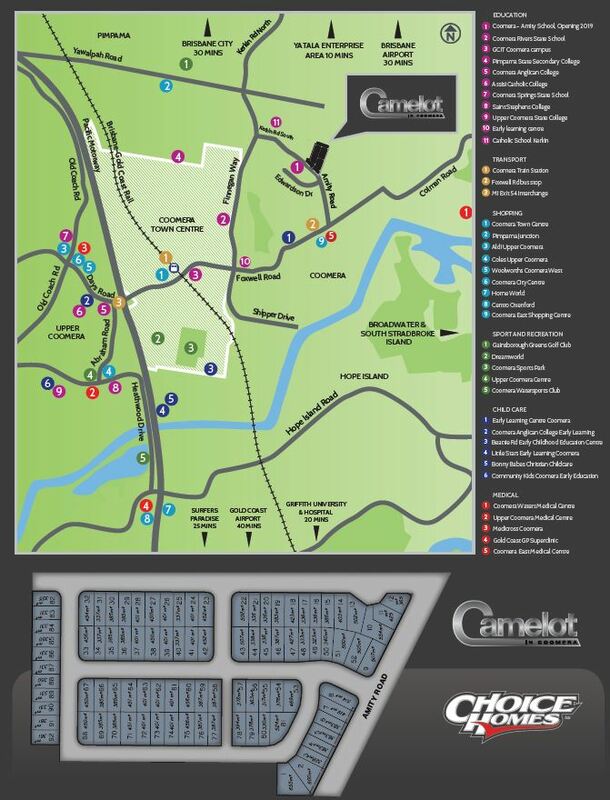 Situated a 2-minute drive from Camelot, our new community. Coomera Amity State Primary School, $15 - $20 million project opening in 2018 and across the road from Camelot, our new community. Catholic School for 2000 students, land secured last year for $15.1 million and first stage to open in 2019 and a 2-minute drive from Camelot, our new community. Gold Coast City Marina & Shipyard – more awarded than any marina and shipyard in Australia and a 5-minute drive from Camelot, our new community. $5 million pledged in latest budget for sporting facilities on the Northern Gold Coast. $40 million Coomera Indoor Sports Centre – now open and ready to host the 2018 Commonwealth Games and a 7-minute drive from Camelot, our new community.